When you have temporomandibular joint (TMJ) disorder, it can make eating painful and difficult. TMJ disorder can make it difficult to open your mouth completely or to chew your food without experiencing discomfort or achiness in your jaw. If you are suffering from TMJ disorder, then it’s time to find a TMJ treatment that will work for you. Here at James Otten Dentistry, we offer an innovative approach to TMJ therapy that can help you find relief from your pain so that you can enjoy your favorite foods again comfortably. In addition to getting the right treatment for your TMJ, there are also a few things you should consider changing up in your diet to reduce pain and discomfort. What foods should you avoid if you have TMJ disorder? Foods that require lots of chewing – Some foods make your jaw have to work a lot harder than others. These are called high-impact foods, and they include hard bread, nuts, steak, bagels and candy, just to name a few. Foods that require big bites – Some foods, like sandwiches or hamburgers, require you to open your mouth wide in order to take a bite. Since TMJ disorder makes it difficult to open your mouth wide comfortably, these foods can be difficult to eat. Inflammatory foods – Some foods can cause your TMJ pain to flare up. These inflammatory foods include refined carbohydrates, sugar and many processed foods. Click here to learn about our TMJ treatment! 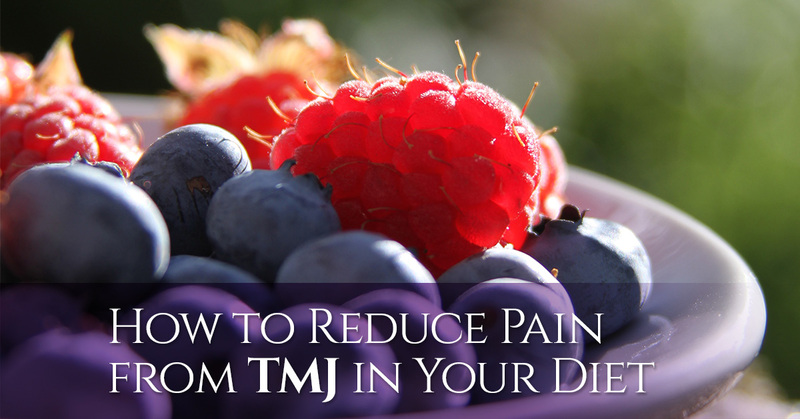 What should you eat to reduce your pain from TMJ? Fluids – Giving your jaw as much rest as possible is important when you have TMJ disorder, which makes liquid-based meals a great option. Smoothies, soups and stews are all delicious meals that can fill you up without making your jaw uncomfortable. Magnesium-rich foods – Magnesium can be incredibly beneficial for people who have TMJ disorder, because it helps to relax the nervous system and the jaw. Foods that are rich in magnesium include dark leafy greens, beans, nuts, bananas, lentils, low-fat dairy products and avocados. Anti-inflammatory foods – Just as some foods can cause inflammation in your jaw, there are other foods that can help to reduce inflammation. Fish, particularly cold water fish, like mackerel or salmon, are good sources of omega 3 fatty acids, which have powerful antioxidant properties. Peppers, berries, broccoli and other colorful fruits and vegetables can also help to reduce inflammation and the discomfort from TMJ disorder. Soft foods – Soft foods are ideal for people who suffer from TMJ disorder because they don’t require a lot of chewing and you won’t need to open your mouth very wide to eat them. Mashed potatoes, scrambled eggs, yogurt and porridge are all great, soft options for people with TMJ disorder. With the right TMJ treatment, you can reduce your pain and eat to your heart’s desire. Our dentist in Lawrence, Dr. James Otten, provides innovative TMJ therapy that has helped many find the health and pain relief they need. Some have even experienced a dramatic improvement in appearance as a result of TMJ treatment. Contact us today to learn more about our TMJ treatment options in Lawrence.